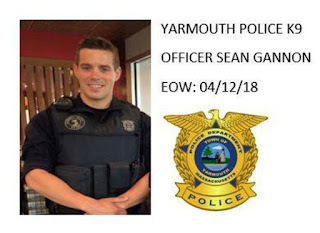 BARNSTABLE — Sean Gannon was a beloved figure in this Cape Cod town, from the town landfill where he would bring workers coffee to the schools where he visited with his police dog Nero.“He was a bright spot in anybody’s day, and he was really good with little kids,” said Carol Woodbury, superintendent of the Dennis-Yarmouth Regional School DistrictGannon, 32, had been a Yarmouth police officer for eight years when he was fatally shot Thursday afternoon while serving a warrant. On Friday, the local schools made counselors available to help children cope with his death.“He was very dedicated to his profession and to the community,” Woodbury said. “It’s just such a loss for us.”At the police department, black and purple banners hung from the building. In the front lobby, a memorial featured a large photo of the smiling officer kneeling with Nero. “End Of Watch 4/12/18,” a message read.Bouquets, a candle, and framed photographs of Gannon with his wife and fellow officers lined the memorial. Outside, dozens of bouquets had been left at a stone edifice honoring the 13 other Yarmouth officers killed in the line of duty since 1952. Nearby, a Yarmouth police cruiser was covered in flowers, balloons, and messages of condolence. A wreath held a ribbon that said “In Honor of Officer Gannon". Another visitor, Tracey Ellis, 59, said she was deeply shaken by Gannon’s killing. “It’s just an awful thing,” Shaughnessy said. “This is a really, really good guy.”Shaughnessy recalled Gannon as an active student who played tennis, ran cross-country, and participated in a number of extracurricular activities. “We will always remember his sacrifice and service,” he said. John Sinopoli cried and wiped a tear after he left off a bouquet of flowers on the cruiser belonging to slain officer Sean Gannon. Gannon attended college at Westfield State University, where he served as a resident assistant and studied abroad, university officials said. He received a bachelor of science degree in criminal justice in 2007. Gannon was still in college when he began his career in law enforcement as a summer officer in Nantucket. He was assigned as a bike patrol officer, said police chief William J. Pittman. After graduating, Gannon joined the Stonehill College police department, where he worked for three years. 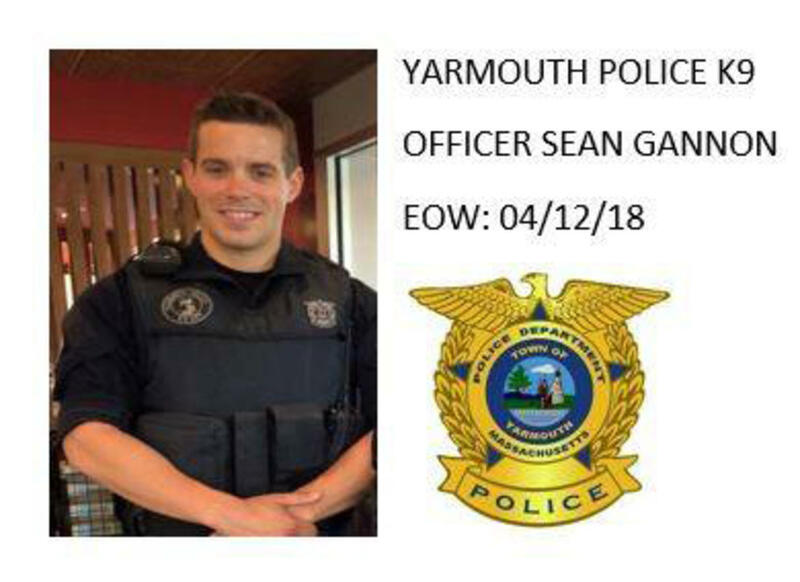 Gannon began working for the Yarmouth Police Department eight years ago. His wife, Dara, works for the Cape Cod Foundation. Xiarhos said a candlelight vigil is scheduled for Saturday at 7 p.m. at police headquarters. Beth Marcus, the co-owner of Cape Cod Beer, a brewery in Hyannis, said Gannon and his wife had made an “incredible impact” on Cape Cod, leaving those who knew them in shock. Marcus and her husband had planned a party Friday to celebrate the brewery’s 14th anniversary, but decided to host the event as a fund-raiser in Gannon’s memory. The Big Brothers Big Sisters of Cape Cod and the Islands, where Gannon volunteered, echoed those sentiments, and posted a photo of Gannon on Facebook with a message of condolence. At the memorial, Robert Eckert, 49, said he chatted with Gannon regularly when Gannon would visit his crew at the town landfill.“He’d check on us, see if we wanted coffee,” Eckert said. “If we wanted something, he would go down and get it.”Gannon was an upbeat, selfless person, he said.